Can you create a garden room from an existing outbuilding? Well if you work with a specialist like Bathstone Garden Rooms the answer is yes! Bathstone Garden Rooms have recently built this brick garden room. In fact only the front elevation is clad in brick with the other three elevations finished in timber to keep the costs down. More and more buyers are looking for a multi use garden building which incorporates both a fully insulated garden room and separate storage shed, this is a particularly good example by Bathstone Garden Rooms. 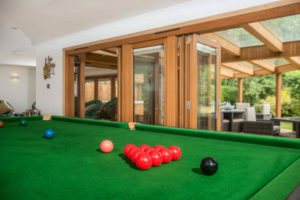 Bathstone Garden Rooms are one of the few garden room suppliers who undertake restoration work, and they have recently restored this garden room which has been around for decades. Bathstone Garden Rooms are known for the buildings they create in oak, and this garden room with a difference is an example of their craftsmanship. Bathstone Garden Rooms design and build both traditional and contemporary style garden rooms, they also will undertake refurbishment work on existing garden buildings. At Bathstone we design buildings to meet our customer’s exact requirements, so when we initially sat down to discuss design for our most recently completed project, it became apparent our customers wanted a splash of colour at the end of their garden.